Just how wrong-o is this Rongorongo board? According to the Wikipedia entry on Rongorongo, this artefact would represent one of only 26 known objects worldwide bearing a Rongorongo inscription. 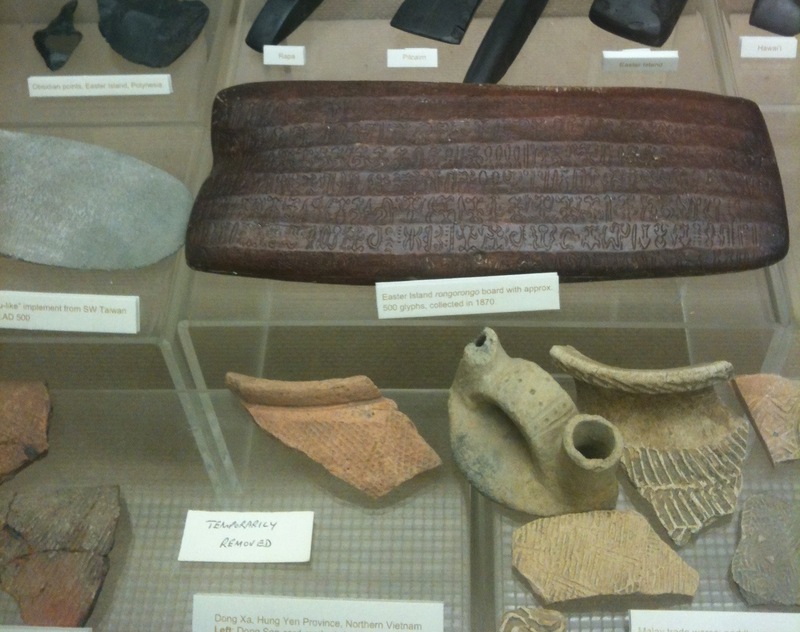 Considering that Easter Island may be the last place where writing was independently invented — after Central America, the Middle East and (perhaps) China — it’s remarkable that such a rare item is sitting casually amongst a collection of Austronesian and Southeast Asian sherds and flake tools. Of course, the question of whether Rongorongo represents actual writing remains vexed as does the authenticity of many of the surviving artefacts. The meaning and traditional use of Rongorongo has tormented scholars from their earliest encounters with it. By the time examples of Rongorongo were being collected for analysis, no literate Easter Islanders remained and the wooden texts were being used for fishing spindles or being burned as firewood. If Rongorongo is writing, as we know it, there is no consensus as to what kind of system it represents or whether the glyphs are merely mnemonics for the oral reproduction of ritual speech.